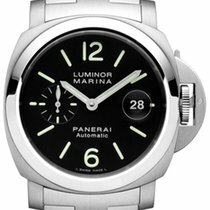 Pre-owned Panerai Luminor Marina PAM00113(Panerai serviced 2018) in exceptional condition. 44mm polished steel case. White dial with Black Arabic numerals and luminous markers and hands. Small seconds dial positioned at 9 o’clock. Sapphire crystal anti reflective glass. Manual Calibre OP XI mechanical movement with 56 hour power reserve. Sapphire crystal display case back. Brown leather strap and polished steel buckle. Water resistant to 300 meters. Supplied with an additional Black rubber strap. E.U Box and Panerai warranty papers dated November 2004. This watch has received a full service and valet at Panerai and therefore carries a 12 month service warranty dated October 2018. The pictures you see are pictures of the actual watch!!. We only sell what we have IN STOCK!